If you're someone who shares your Hulu account with friends and family, let me be first to acknowledge you as a hero. That being said, heroes have messy profiles — your account quickly reflects the viewing habits of your shared users, making it difficult to keep your watch history yours. That changes now, with new tools from Hulu. 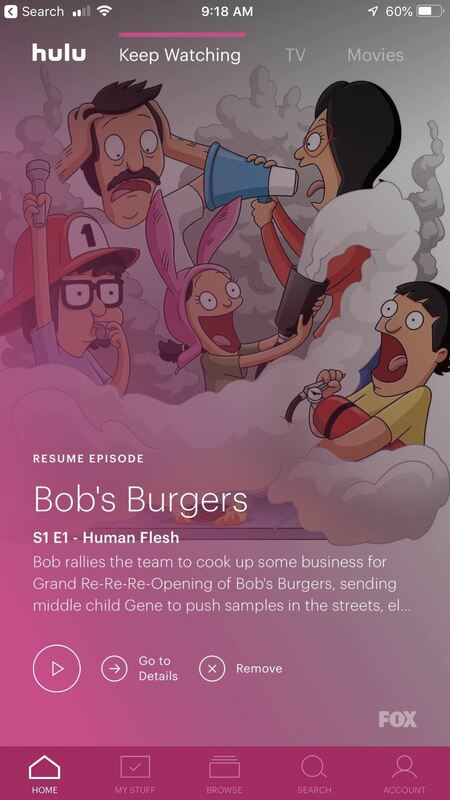 If you're seeing titles you didn't watch on your profile, or if you don't want others knowing what titles you watch, Hulu's new "Remove" function is right up your alley. Announced on May 17, the new feature quickly and easily allows you to delete shows and movies from your watch history, and, best of all, it doesn't judge. Deleting titles from your history is simple enough. The "Remove" button will appear next to any title you've previously viewed, under Hulu's "Keep Watching" tab. Once tapped, the movie or show leaves you watch history and appears as any other title would should you or any shared users come across it in the wild. (1) Old version. (2) Updated version. If you happen to be someone who wants to remove titles from their watch history, for whatever reason, this new addition should be welcomed warmly.